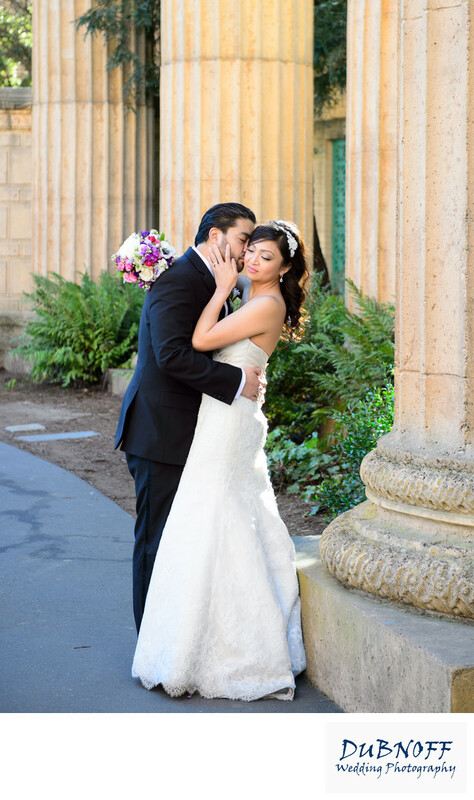 More brides and grooms select the Palace of Fine Arts as a wedding photography location then any other destination in San Francisco. If you are a San Francisco wedding photographer, you have photographed more than your share of weddings here. The Palace offers so much in terms of wedding photography because you have beautiful architecture, the pond and even some woodsy areas right there. For our typical photo session, we take the newlyweds to the back of the building and create nice images around all of the tall columns and trees. There are all kinds of little niches and passageways that result in fantastic photography areas and creative backgrounds. Once we have completed our tour around the back and also checked out the Rotunda, then we go to the front and get a few of the iconic Palace of Fine Arts wedding images. These of course included photos of the main building, the pond and the fountain.